One INVITATION FROM THE TATE. Three SHANGHAID OR VORTICISM RESURRECTED. A SEA YARN FOR ABSTRACT ARTISTS. Four A LETTER TO 'THE LISTENER'. Five A LETTER TO 'THE TIMES'. Six A LETTER TO 'THE NEW STATESMAN'. 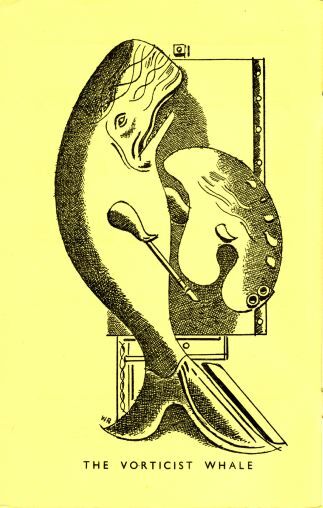 Seven KING OF VORTICIST LAND: or STOP KIDDING. A BEDTIME STORY. Early in February I received a letter from the Tate Gallery, signed by an assistant keeper, saying that they were arranging an exhibition of Wyndham Lewis, and hoped besides to include some other Vorticists. Would I offer suggestions. This relates how, in the month of July, in the year 1956, I was bound and gagged by a press-gang and forced to serve aboard the old hulk 'Vorticism' then lying off Millbank by Thames-side, under the command of Captain 'Manifesto' Lewis and his chief mate 'Little' John; also of the voyage I made in her across the wide and abstract sea. July 6th . . . Slip anchor in fair weather and head for the open sea. On the first day out observed the chief mate beating off with a swatter some large flies that were attacking the skipper. Today, after an uneventful voyage of 35 years, a stowaway is discovered aboard. The crew with buckets of salt water christened him 'Mike'. July 21st . . . Mike, from the 'Crow's-nest', sights a large whale catching sprats off our Starboard Bow. For several days now the ship has been strangely becalmed; sea like glass; the skipper is troubled and has retired below to write a 'Manifesto' . . . 'Little' John, the chief mate, is furious with me for some reason and threatens to clap me in 'Irons'; Mike is teaching the skipper's parrot to say 'Vorticism' . . . A week later . . . Still becalmed, should a tornado blow up I shall try to reach the island of the 'Apes', who I think are a friendly lot, despite the terrifying tales the skipper tells of them. Still in the Doldrums! Doldrums! Doldrums! It is thought the good ship 'Vorticism' hit a mudbank, and was lost with all hands at a spot near where the Tate now stands. This document was found, in a sealed casket floating in the sea, by an official of the 'Arts Council', whilst bathing off Southend, and is now preserved in the 'Museum of Oddities'. Manifestos, Pronunciamentos, Ultimatums have always been as necessary a part of Mr. Wyndham Lewis's equipment as an artist as his palette and brushes. His present exhibition has all the customary introductions, instructions, and even a little tip to the visitor to buy his book (quite cheap) and learn all about Abstract Art. 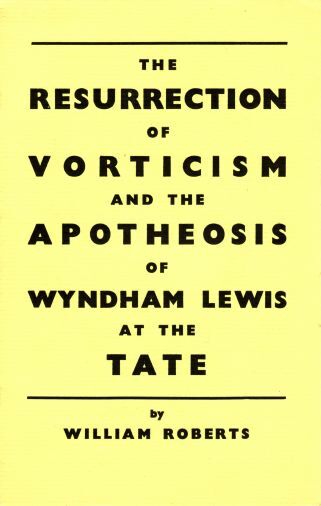 Moreover, Lewis is asking the public to accept him as the only Vorticist. Now this may not be very important in itself, but I do prefer my history served with a proper helping of veracity. To prove his claim, a massive exhibition of his pictures has been put on at the Tate Gallery. The arrangement is ingenious, for, as if to emphasise his claim, in a smaller room adjoining his own two spacious halls there is on view a few minor works by artists who were misguided enough to think that they had once been Vorticists. Mr. Lewis, however, knows better. He is in effect saying that it is not the painting he did in little more than a year around 1914 as a member of the Vorticist Group, but his whole output over a period of almost 50 years that is Vorticism. Years ago Lewis had a phrase he was very fond of repeating; it runs: 'It wouldn't be very clever of us to let anyone else be clever at our expense.' When I heard that an exhibition of Lewis and Vorticism was being organised at the Tate, yet received no invitation from Lewis or the Director to participate, I had a strong feeling that someone was about to be clever at somebody else's expense. There are certain indications that I was not mistaken in this, for when a collector, who possesses certain of my paintings, offered, without my knowledge, to lend the organisers a picture measuring 4ft. x 5ft., it was refused because it was too big. At a certain period Lewis preferred to be known as 'The Enemy', and at all times he has enjoyed throwing out challenges. This kind of thing is contagious, for I note that some of his more recent admirers have become infected, adopting provocative attitudes. Thus Sir John Rothenstein, in his contribution to the catalogue: 'His detractors, fearful of his fly-swatter, have ever been reluctant to attack him openly and now, fearful of having their 'taste' called in question by attacking an old blind man, they are more than ever reticent.' Fearful, reticent, detractor, flies; afraid of the swatter! Not very formidable opposition is it? Next, Mr. Ayrton, in his New Statesman article 'The Stone Guest': 'It does not look from this exhibition as if Vorticism was a movement engendered in terms of the robust collective romps of the Futurists. Rather unfairly, since several of these are men of talent, the other Vorticists collected at the Tate look rather like a lot of sprats a whale has caught.' But Mike, would Lewis appear so whale-like if his show had been limited to his one genuine Vorticist exhibit 'Revolution'? After this, certainly, my scruples are justified. Despite these latter-day shrill blasts from Lewis's aesthetic trumpet and the endeavours of his friends at the Tate to minimise the standing of his former associates, this affair is a simple one. Vorticism ended, in fact, when at a certain period, at Lord Derby's call, leaving our large puce-coloured Blasts behind us, we both marched off to endure blasts of another sort upon the battlefields of Flanders. Like so much else, the first world war finished it. On our return an attempt to revive the Group but under a new name, Group X, signifies what value we attached to the word Vorticism four decades ago. This incident Lewis omits to mention, not wishing, I suppose, to disturb the unity of the Vorticist design. By the way, it was not Lewis who was the organiser of Group X, as is claimed in the chronology of the catalogue, but E. McKnight-Kauffer, whose death occurred recently in New York. Moreover, to display in 1956 the accumulated work of 50 years and couple it with Vorticism, at the same time limiting the exhibits of the other members of the Group to little more than one year that, Lewis, is surely being clever at their expense! In Wyndham Lewis's introduction to the catalogue of his exhibition at the Tate this sentence appears: 'Vorticism, in fact, was what I, personally, did and said at a certain period.' At the risk of being labelled an hostile gorilla, I wish to refute this statement. In 1913, at the start of his career as a painter, Lewis had no wish to stand alone; far from it, for his ambitions, and the fashion of the times, made it expedient that he should be part of a Group. With Cubistic and Futuristic Groups operating on the Continent something similar had to be done in England. Casting his eyes around Lewis found (perhaps to his surprise) that there were other artists in London as well producing work inspired by Picasso and the painting being done in Paris. In no time at all, from among these experimenters, a Group was got together. 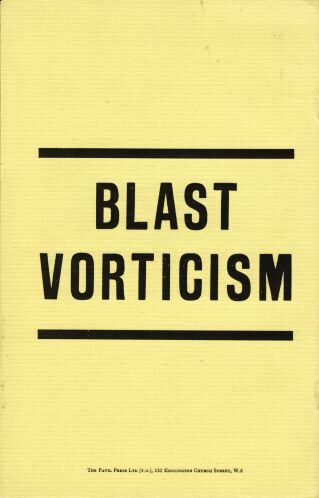 With Ezra Pound officiating at the ceremony the Group was christened Vorticist. Anticipating some such 'Staging' as this, I kept silent on receipt of an invitation to participate, especially as the invitation had not come from either Lewis or the Director of the Tate. My suspicions were confirmed when I heard that a collector of my work had offered, unknown to me, to lend the Gallery a picture (size 4ft x 5ft.) which they had refused because it was 'TOO BIG'. They preferred to rummage elsewhere for my work the sizes of which, in inches, made them more acceptable for their purpose. To be correct, Lewis's statement should run thus . . . 'Vorticism' in fact was a word used to symbolise the painting and sculpture of the artists named below who agreed to be known as the 'Vorticist Group' at a certain period . . . Gaudier-Brzeska, Wadsworth, Etchells, Dismorr, Saunders, Roberts, Lewis. It is interesting to observe that since the war the opinion is held in certain quarters that Wyndham Lewis needs protecting. This strikes me as not exactly flattering to Lewis, since he has always considered himself the King-Pin among the artists and aestheticians of his time. Moreover, in my view he carries the heaviest armament and equipment for attack upon the polemical battlefield of any painter I know. Battlegrounds of the polemical kind at least are not too easily come by, hence Lewis, for lack of foes, has been compelled during several decades to blast anyone or anything loitering near his preserves, first as Group Führer, then as the 'Enemy of all Groups'. Now, at this late hour, the ground piled high around him with the remains of rivals and other hostile apes, up springs . . . what? . . . a Protector! who solidly ensconced by the elbow of his hero, infuriated by the thought that the old warrior has received no medals for his valour against the apes, yelps defiance. The author of 'The Stone Guest', in common with other hero worshippers, is inclined to be gullible where his hero is concerned. Thus when he sees Lewis puff out his chest and bellow in thunderous tones 'I am the only Vorticist, and there shall be none other but me.' leaps to his feet in a posture of attack, excitedly shrieking, 'Yes! Do you hear, you apes, the only Vorticist, and whoever says he isn't is a . . . SPRAT!' Mr. Ayrton accepts too readily the definition which Lewis in his introduction to the Tate catalogue gives of Vorticism: 'Vorticism in fact was what I personally did and said at a certain period.' This places the rest of the group in an awkward situation doesn't it! Then, in order to finish us off completely up jumps again our zealous 'Wyndhamlewisian' to hurl stinking fish in our direction. Wyndham Lewis, in his explanation of what Vorticism is, has overlooked the existence of six artists, his associates at this certain period. In order to jog his memory I will give my interpretation of the word. I would like to add further that of this Vorticist Group, if we exclude Etchells, who gave up painting soon after the first World War, and who can be no longer interested, three remain: Lewis, Miss Saunders, and myself. The job of clarifying the Vorticist puzzle would seem to have fallen to me. Now kiddies, once upon a time there were six little 'VORTS' and they all lived happily together (almost) in a little house called 'BLAST', in the land of 'VORTICISM': well kiddies, one fine day one of these little 'VORTS' thought how nice it would be if he were to grow much bigger than the rest, then everyone would say he was the biggest 'VORT' in the whole wide world. So one night whilst the others were snugly asleep in their little cots, he stole away to a castle by the banks of the Thames where dwelt 'CURATOR', a powerful dragon. When 'CURATOR' heard 'VORT'S' wish he cast a Spell upon the other little 'VORTS' and they slept for 40 years. At the end of this time 'VORT' had grown so tall that the whole world named him 'VORTICIST' which means King of the land of 'VORTICISM'. Goodnight kiddies that is all!